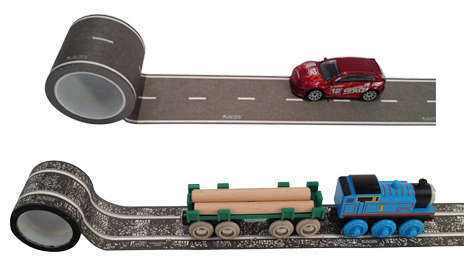 Tape widths are compatible with most common wooden trains including Thomas the Tank Engine, BRIO, Melissa and Doug, Ikea, Big Jigs, and some LEGO trains. The 1:64 scale road PlayTape is compatible with popular toy cars like Mattel Hot Wheels and Matchbox. PlayTape is priced starting at $7.99 a roll up to $12.99 and can be purchased from InRoad Toys and Amazon. Ants walking in a single file on a transparent tape. Dog or cat prints on transparent tape. I’m sure there are others.